Japanese magnolias (Magnolia x soulangeana) have showy tulip- or cup-shaped blooms in the early spring before the leaves appear. The white, pink or purple flowers also bloom sporadically throughout the summer and fall. The silvery-gray bark of the trunk and branches adds winter interest to a garden. Few diseases affect Japanese magnolias. They grow in Zones 5 to 8 in the sun or partial shade. They prefer slightly acidic, moist but well-drained soil. Japanese magnolias are also called saucer magnolias and Japanese tulip trees. Several bacterial and fungal diseases cause leaf spots on Japanese magnolias. The irregular, circular or concentric spots usually appear during wet weather or when the tree is under stress, such as drought. Leaf spots affect the cosmetic appearance of the infected leaves, but usually do not cause permanent damage. To help prevent leaf spots, leave adequate space for air circulation between trees when planting more than one. Fertilize Japanese magnolias regularly, following the manufacturer’s instructions, and water thoroughly during periods of drought. A type of Botrytis fungus causes sooty mold, or gray mold, on Japanese magnolias. Lesions form on infected stems, leaves, buds, flowers and fruit. A web of gray or black mycelium grows in the lesions and causes the affected plant parts to die. Sooty mold grows in humid conditions. When planting more than one tree, leave adequate space for air circulation. Remove and destroy infected plant parts, as well as any debris around the tree. Use a fungicide approved for sooty mold on Japanese magnolias, according to the manufacturer’s directions. Verticillium wilt is a soil-borne fungus that infects the roots of Japanese magnolias. It can affect all or part of the tree, causing it to decline and eventually die. Foliage in the affected part of the tree turns yellow or reddish, curls, wilts and drops off. The disease causes branch dieback and infected wood has discolored streaks under the bark. No effective cultural or chemical treatment for verticillium wilt exists. Remove and destroy diseased trees and as much of their root systems as possible, and do not plant another tree in the same area for several years. 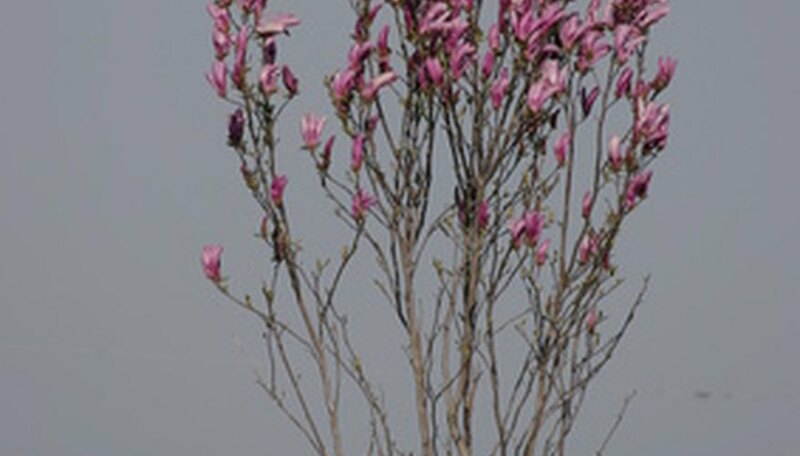 Some varieties of Japanese magnolias are resistant to verticillium wilt.